Frontier is continuing to pull back capacity at its Milwaukee hub with six more routes to be cut next month. Once considered a key hub for the combined operations of Frontier and Midwest Airlines now unified under the Frontier brand, Milwaukee’s importance eroded last year after Frontier embarked on a network revamp as part of a USD120 million cost improvement programme to restructure Frontier to regain lost profitability. Milwaukee has taken the brunt of the network changes resulting from the cost cutting. Daily departures offered by Frontier from the airport will plummet to only 18 from mid-April of this year. This represents a 73% drop from the 67 departures from Milwaukee operated during the peak summer period of 2011 and a 44% drop compared to the 32 departures currently operated. Midwest had an even bigger operation at Milwaukee before it was sold to Frontier parent Republic Airways Holdings in 2009. Republic is now redoubling its efforts at Frontier’s Denver hub. Currently 80% of Frontier's capacity is allocated to Denver with the remaining 20% split evenly between Milwaukee and Midwest’s other legacy hub of Kansas City. Frontier expects 85% of its capacity to be centred in Denver for its upcoming summer schedule as capacity coming out of Milwaukee is redirected to Denver. Many of the cuts Frontier made from Milwaukee last year were in markets flown with smaller 37 and 50-seat jets that became even more economically undesirable as fuel prices climbed throughout 2011. Those flights were operated as Frontier Express by Republic’s regional subsidiaries. Some of the regional jets ceasing operations in Milwaukee were redeployed in temporary charter service. Republic has steadily been removing the small jets from Frontier’s branded operations since it began a thorough review of its network last year using a new network analysis system. Its cost savings from fleet and network changes reached USD35 million, which was USD10 million higher than originally estimated. 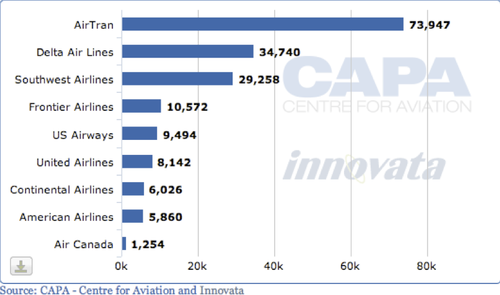 The new tool calculated losses from the operation of Embraer E170s in the Frontier network higher than previous estimates. The last E170 operated under the Frontier brand transitioned out of its fleet in January, and by the end of 2012 all aircraft below 99-seats will exit Frontier. Frontier’s changes in Milwaukee have already resulted in a drastic reduction in the seats offered from the airport by the carrier. Based on current schedules, AirTran offers 63,375 more weekly seats from Milwaukee than Frontier. 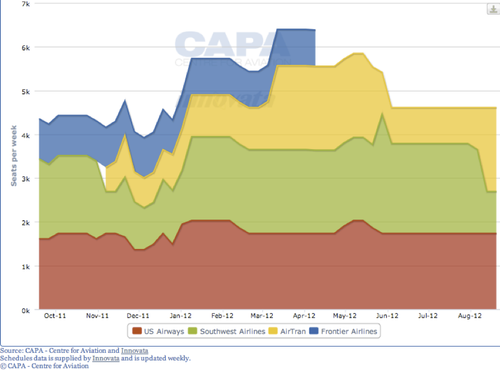 The combined 103,205 of Southwest and AirTan dwarf the 10,572 seats available on Frontier. The Frontier capacity figure for Milwaukee will go down sharply yet again in April as the carrier cuts six routes, giving it only 18 daliy departures. Frontier’s new round of reductions from Milwaukee are to the larger markets of Dallas/Fort Worth, Kansas City, Philadelphia, Phoenix and Newark. Flights to the smaller destination of Grand Rapids, Michigan are also being eliminated. Two of the markets, Dallas and Philadelphia, are dominated by legacy carriers American Airlines and US Airways while Southwest has the largest presence in Kansas City. Phoenix is one of the most competitive markets, with Frontier offering just a fraction of the weekly seats flown by AirTran, Southwest and US Airways. 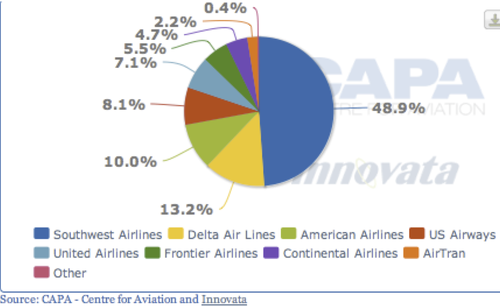 Despite Frontier’s reduced presence and Delta Air Line’s second place standing in terms of seats offered, low-cost carriers continue to dominate the market, holding a 63.5% seat share based on current schedules. Frontier believes it is making the right moves in Milwaukee and to a lesser degree in Kansas City, where current schedules show it now only accounts for only 5.5% of the seats offered from the airport, which is dominated by Southwest. During Republic’s recent analyst call to discuss 4Q2011 earnings, Frontier executives stated the changes undertaken in Milwaukee and Kansas City contributed to positive passenger unit revenue growth of 10.7% during the fourth quarter of 2011 and 11% for the full year. As it shies away from the Milwaukee market dominated by AirTran and Southwest, Frontier is attempting to reap the benefits of Southwest’s decision to cut smaller markets operated by AirTran as the networks of the two carriers become more intertwined. Southwest closed on its acquisition of AirTran in May-2011 and since that time Southwest has opted to eliminate 16 AirTran markets. Frontier executives have specifically stated the carrier is moving into point-to-point markets where it concludes it has a competitive advantage in light of recent consolidation in the US. In that vein, Frontier is launching flights from Orlando to Harrisburg and Allentown, Pennsylvania and Bloomington, Illinois in May before AirTran exits the markets in August. In most markets, Frontier is using larger-gauge 138-seat A319 aircraft compared with the 117-seat Boeing 717 AirTran operates in some of the markets being eliminated from Orlando. Frontier is also commencing flights from its Denver hub to Harrisburg and Bloomington in May. Frontier will have a much smaller footprint than AirTran from Orlando to the two new Pennsylvania markets, offering just 552 weekly seats on its two flights to Allentown and 828 seats on three times weekly services to Harrisburg. AirTran’s weekly seats to Allentown peaked at nearly 1918 in Dec-2011, whilst seat counts on the carrier’s Orlando-Harrisburg reached roughly 1638 per week in January of this year. Frontier estimates that during the summer timetable it will offer 68 non-stop flights from its premiere hub, which it states is a record for the carrier. It appears the airline is applying its broader strategy of picking markets not totally dominated by its rivals in Denver, Southwest and United Airlines. Of the five new markets being introduced by Frontier from its primary hub in May, it only faces competition on two of the pairings: Cedar Rapids, Iowa and Great Falls, Montana. United offers Express service in those markets with a combination of 50 and 70-seat jets compared with 99-seat E190s being operated under the Frontier banner by Republic’s regional subsidiaries. It faces no competition on the new flights to the new seasonal destinations of Bellingham, Washington and Harrisburg, Pennsylvania and to the new year-round destination of Bloomington. The airline is also going on the offensive in May when it begins flights from Colorado Springs located just 112km south of Denver through the introduction of new narrowbody flights to Phoenix, Portland, Oregon and Seattle, Washington, offering non-stop service to those destinations not currently available from the airport. Low frequency, LCC Allegiant now only offers twice-weekly fights from Colorado Springs to the secondary Phoenix Mesa Airport. Republic has declared its intent to “separate” Frontier from its core regional feed business, and as it shops Frontier around to potential buyers or readies it for a spinoff, the holding company has opted to reshuffle how financial performance is reported for each business segment. Flights performed by Republic’s regional subsidiaries as Frontier Express are transitioning to pro-rate agreements, which means Republic assumes fuel and some ticketing expenses but also collects a portion of the revenue generated on those segments. All results in the fixed-fee segment in 2012 are being recorded in the Republic business segment, which results in Frontier’s financial performance only encompassing the operation of its Airbus narrowbodies. Republic believes the new reporting structure gives stakeholders a better understanding of how it performs stand-alone compared with Frontier. In the meantime, Frontier is continuing its quest to become an ultra LCC as Republic seeks to find a suitor for the carrier. In 2012 Frontier aims to achieve average unit costs on its Airbus operations of USD 6.42 cents excluding fuel. 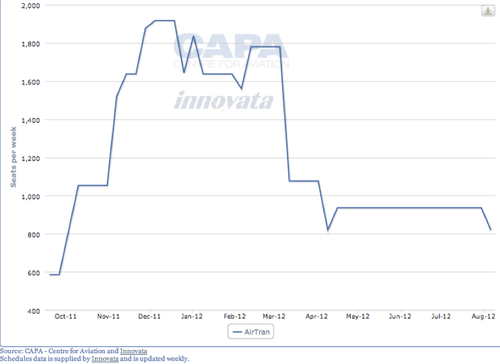 In comparison, current ultra LCCs Allegiant and Spirit each recorded unit costs of USD 5.64 cents for the first nine months of 2011.